Save time by connecting Mailchimp with PayGo using PayGo MC. When you use PayGo MC, your marketing list will automatically update as you run your business with PayGo POS. Whether you’re entering a customer for the first time, or switching the preference of a customer you’ve been emailing for years, PayGo MC will make the change in Mailchimp for you. With PayGo MC, you no longer have to export information out of PayGo and then import it into Mailchimp. In this article, you’ll learn how to set up and use PayGo MC. 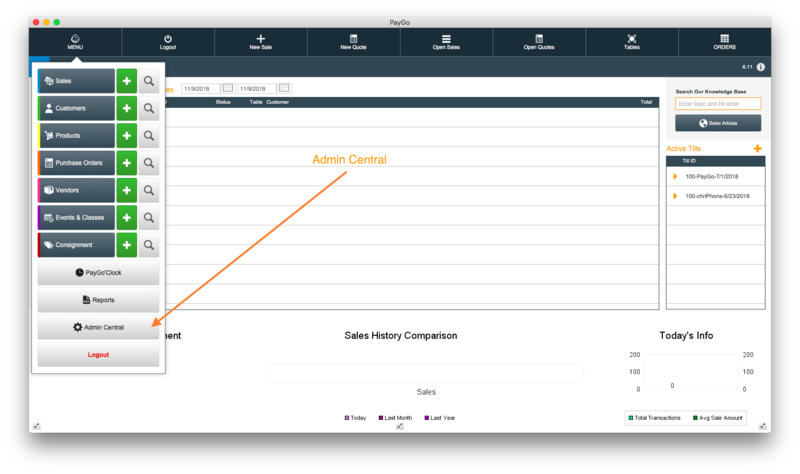 PayGo 6.0: Click the Admin Central button on your Menu. This will take you to the Admin & Settings screen. 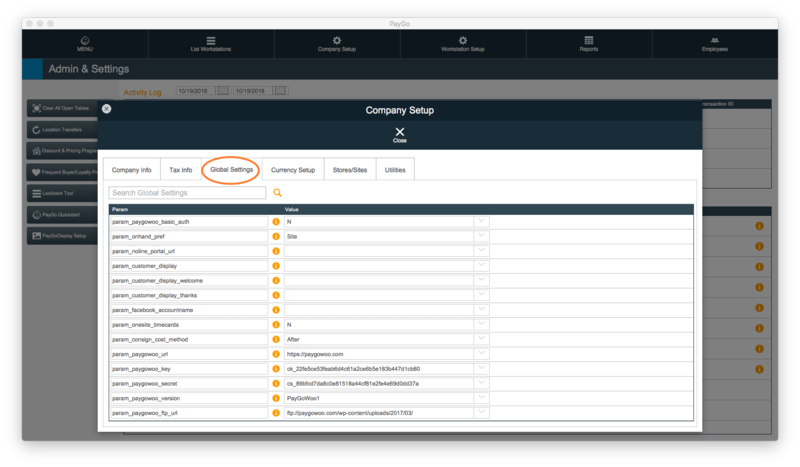 Next, click the Company Setup button at the top of your screen. This will open the Company Setup screen. Next, click on the Global Settings tab. 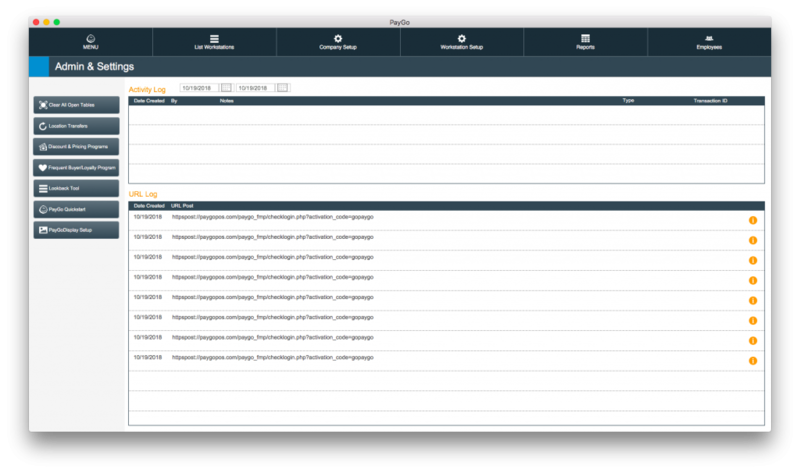 PayGo 5.9: Click the Settings & Options button on your Menu Screen. This will open a sub-menu. Next, click the Company button. This will open the Company Setup screen. PayGo 5.6 and Below: Click the Company Setup button on your Menu Screen. Ready to update to PayGo 6.0? Submit a Support Ticket to let our team know. In the Search field below the tab, type “mailchimp” and click the Magnifying Glass icon. param_mailchimp_active: Typing Y in this field will activate your PayGo MC campaigns. param_mailchimp_url: https://YOURCODE.api.mailchimp.com/3.0/ To find your code, log into Mailchimp and look at the URL. Your code consists of the letters and numbers after https:// and preceding .admin. For example those letters and number for PayGo are us12 (pictured below). param_mailchimp_list_id: This is the list ID of your Default mailing list. You get this by logging into your Mailchimp account and following these directions: Get your MailChimp List ID. param_mailchimp_api: This code is obtained by logging into your Mailchimp account. Please read more here. param_mailchimp_user: Your organization’s MailChimp username. When all information has been entered, close the screen. Your changes will be saved. 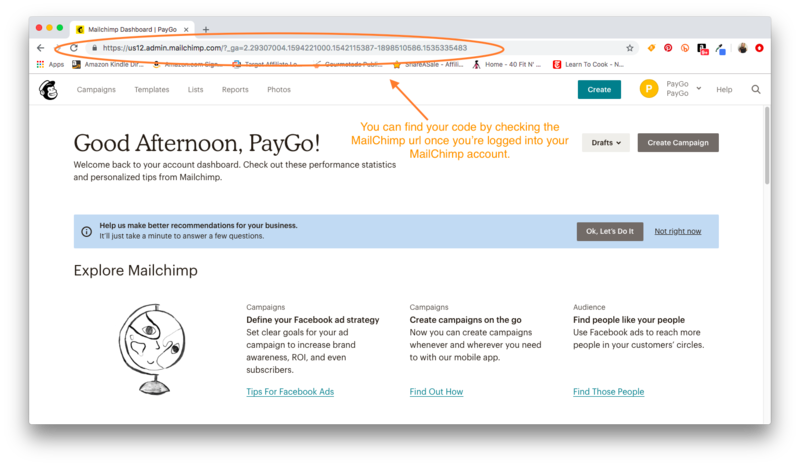 There are two ways you can add customers to PayGo MC, so that they connect to your default Mailchimp mailing list. 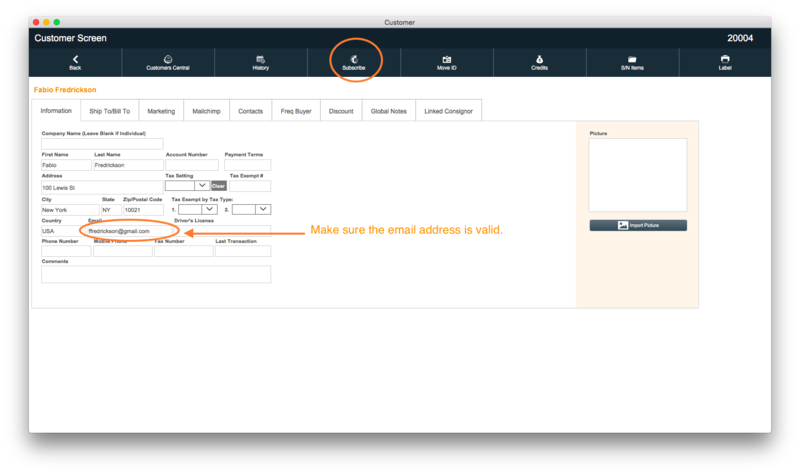 When you’re adding a customer to a sale make sure to enter their valid email address in the Information Tab of your Customer Entry screen. Then, go about completing the sale as normal. When you post the sale, PayGo will automatically add/update the customer on your default mailing list. Click on Customers in PayGo’s drop-down menu. 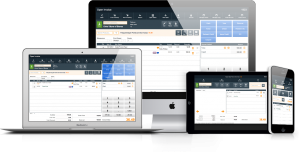 After selecting Customers, you will see a list of your customers. Click on the Customer Record you would like to add to your Mailchimp account. 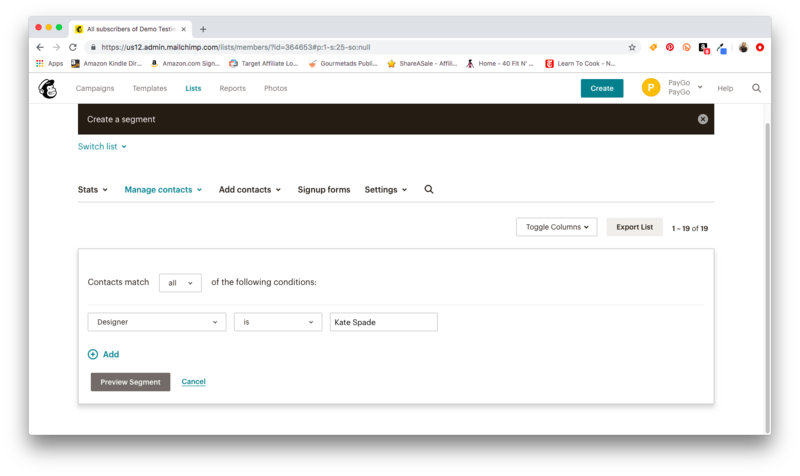 Regardless of which way you access your customer’s record, on the Customer Entry screen, you will that there is a Mailchimp button at the top center of it. If the customer is not on your mailing list, you’ll see a Subscribe button. Click Subscribe and they will be added to your default mailing list in Mailchimp. If the customer is on your default mailing list, you’ll see an Unsubscribe button. 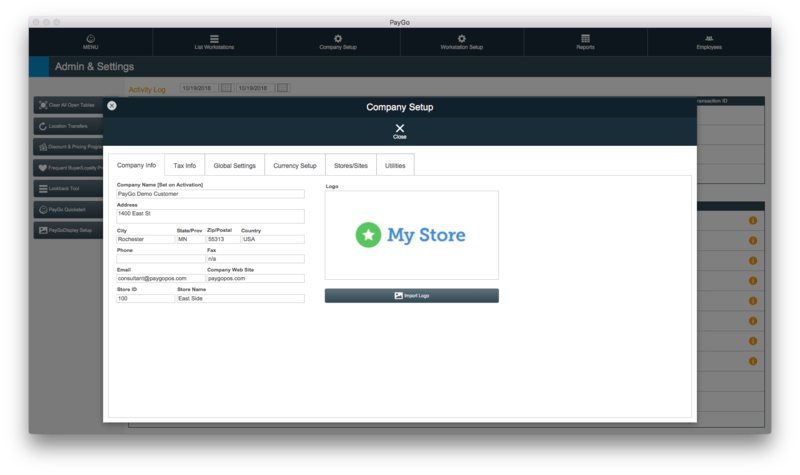 On the Customer Entry screen, you will see that there is a Mailchimp button. 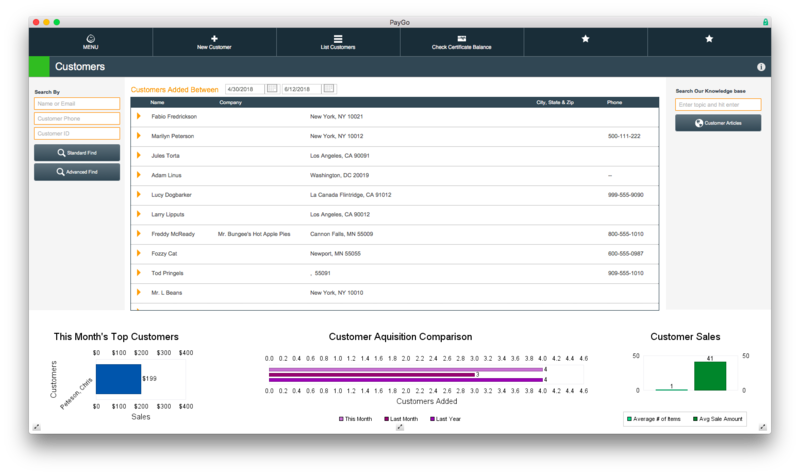 You can segment your customers using 5 fields within PayGo. In this section, you’ll learn how. 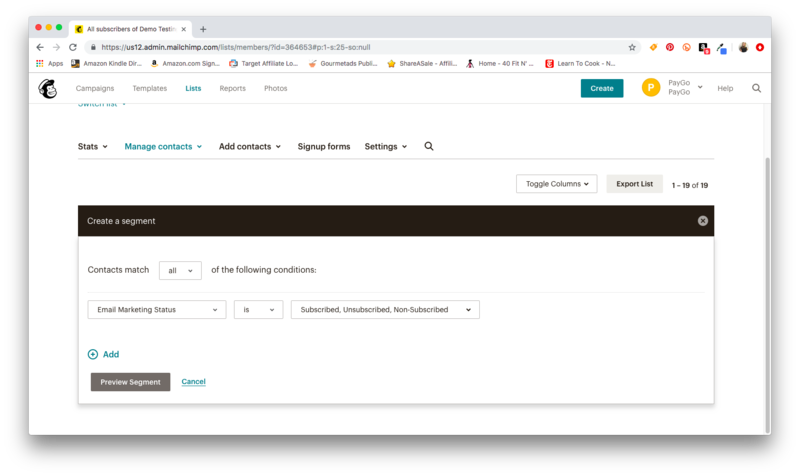 If you want to segment your customers in Mailchimp using PayGo, make sure to establish custom marketing fields prior to subscribing a customer to your default list. In the Customer Screen select the Marketing tab. 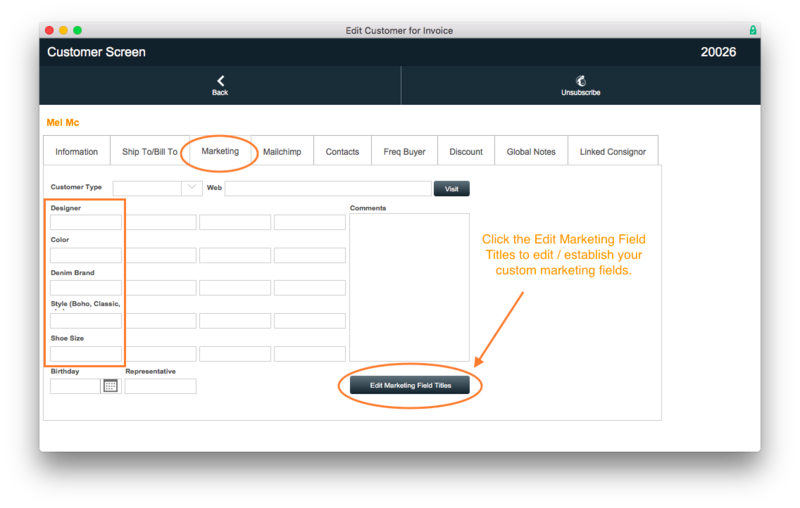 Click the Edit Marketing Field Titles to create custom fields that you can link to your Mailchimp account. 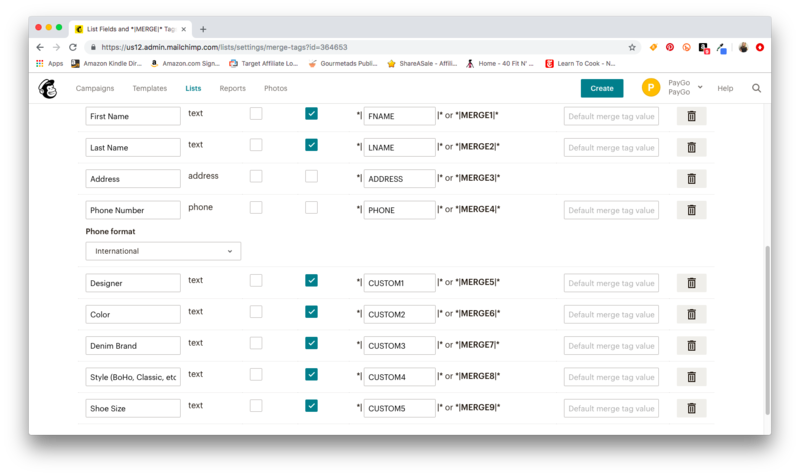 The 5 fields in the left column of your Customer Screen are the ones that can be used to further segment your customers in Mailchimp. Edit your fields accordingly. Once you’ve established your custom marketing fields in PayGo, it’s time to set up matching List fields and Merge tags in Mailchimp. First, go to your default account in Mailchimp. Then, click on Settings in the top navigation. Select List fields and Merge tabs in the drop-down. 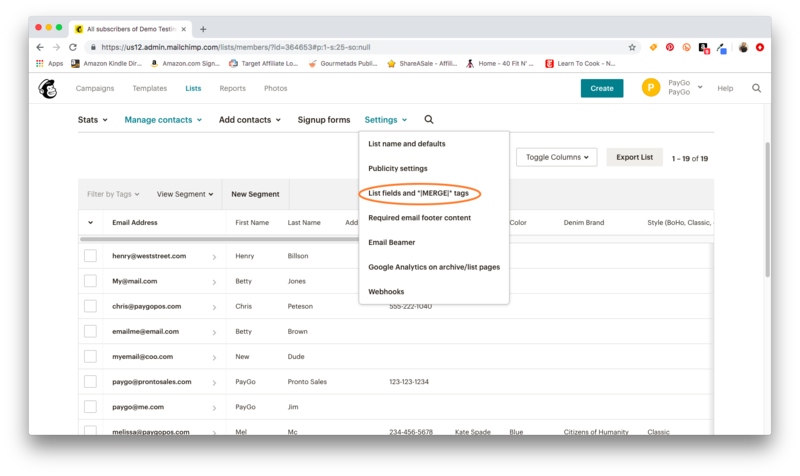 In the bottom of the List fields and Merge tags screen, you’ll be able to create Custom fields in Mailchimp that match your Marketing fields in PayGo. First, click the Add A Field button. Then, select Text as the type of field to add. Next, enter the text that will match what you have in your PayGo POS software’s Marketing field. For this example, I’ve entered Designer. Across from Designer, I’ve entered Custom1. Entering Custom1 matches the field that I’m creating in Mailchimp with the one I’ve created in PayGo. 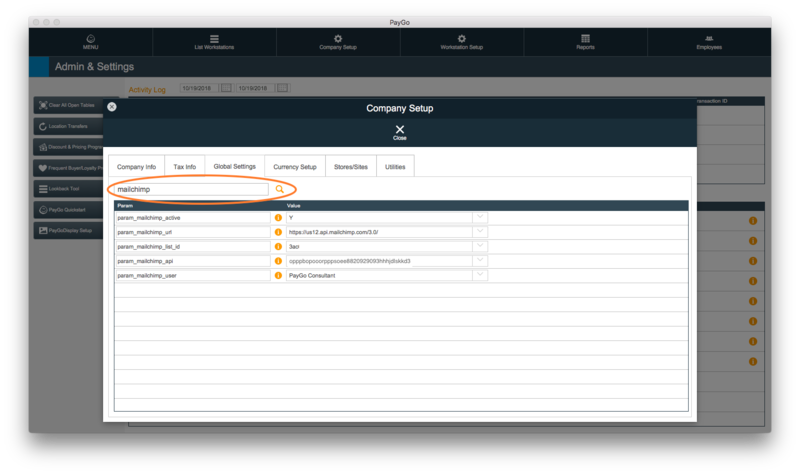 You can create up to 5 additional fields that will link your PayGo and Mailchimp data. To match what I have entered into PayGo, after Designer I have added Color. Across from color, CUSTOM2. Then Denim Brand and across from it CUSTOM3, and so on. Now, when looking at the email list, Designer, Color, Denim Brand, etc. are across the top of the email list. Why create all of these fields? To better segment your list and connect with your customers by providing them with information they care about. First, click on New Segment. The list shown when clicking on the drop-down will include the Custom fields that you have created. For this example, I am selecting “Designer” from the drop-down list. Then, I am going to look for any customer on my list whose designer of choice is Kate Spade. Mailchimp generates a list based on the criteria provided. Click the Save Segment button and market away. Need to Remove a Customer from PayGo MC? Once you’ve accessed your customer’s Customer Entry screen, click the Unsubscribe button at the top of the screen. The customer will be removed from all future Mailchimp marketing campaigns. 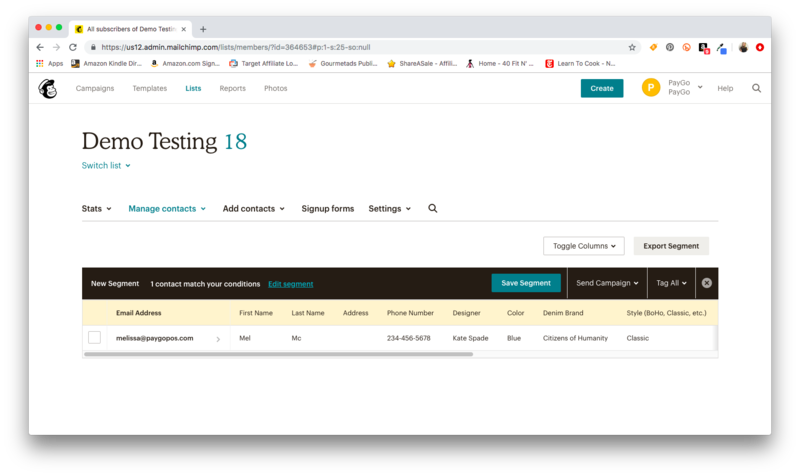 Using Mailchimp, you can set up automatic marketing campaigns, and templates. Need help with this? Check out PayGo’s Automated Marketing Service.